Jesus, Eternal Light, enlighten our sin darken, world, homes, churches, and hearts with your forgiveness, grace and peace. Make us lanterns of your love and life. en to the Southern District will go to the affected area. Southern District President, Rev. Kurtis Schultz deploys District Disaster Response Coordinator (DDRC) at the request of the Hattiesburg MS Civic Response Leaders. to assist with recovery efforts in Columbia MS. .
Southern District DDRC Rev. Ed Brashier, known simply as Pastor Ed to volunteers, will arrive today. 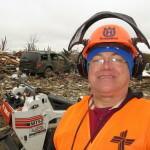 As Director of Shepherd’s Heart Disaster Response Ministry, Pastor Ed is equipped with chainsaws, a compact Bobcat loader, extra safety equipment, and 30 years of disaster response experience. All the equipment made possible by donations of LCMS members,by the and his expenses will be underwritten by the Southern District..